I have finally finished unpacking all of my boxes and organizing my workspace! Here are some pictures from my new studio! First, here is where all the painting magic happens. I have LOTS of paint and brushes. My craft books are always within reach. I am an avid collector of all things vintage and cute animals for inspiration. I love deer, squirrels, foxes, owls and retro designs. 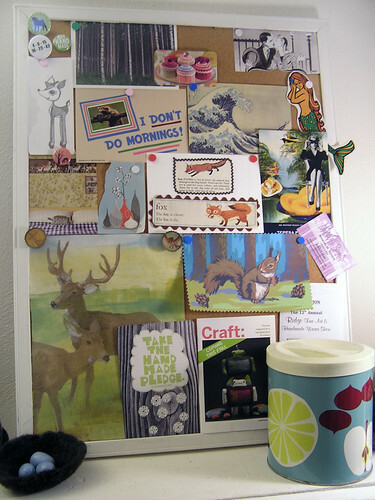 Here’s a closeup of my board: Can you spot some locally made items here? BarrelofMonkeys, EKRA, alwaystheforest, Betz White (not from MI, but love her stuff), Teresa Peterson, and OutYourBackDoor. 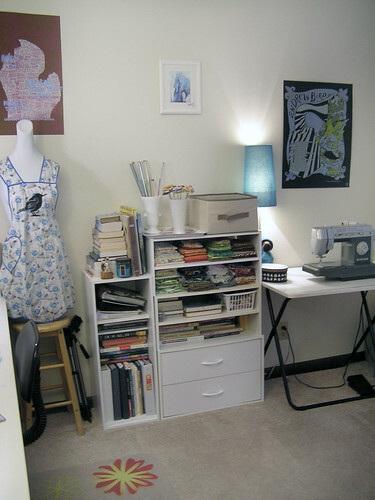 Lastly, here’s my sewing area. I have lots of vintage fabrics! My stepdad saved this industrial Singer sewing machine from being thrown away, it works like a dream! I’m starting an art collection for my walls. So far I have a screen printed poster from the first DUCF I vended in, a locally made water color painting by Amanda Simmons, and a screen printed Andrew Bird (fave musician!) poster from Etsy artist dsudyka. 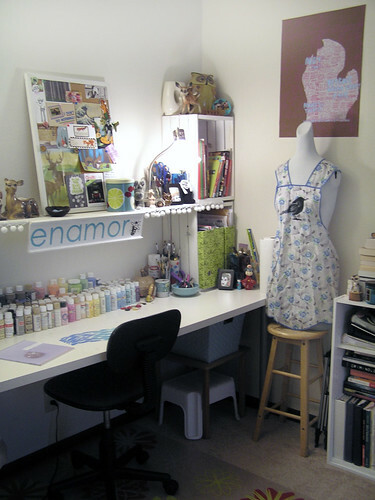 Whats your favorite thing in your workspace?